How does India’s youth invest its money? 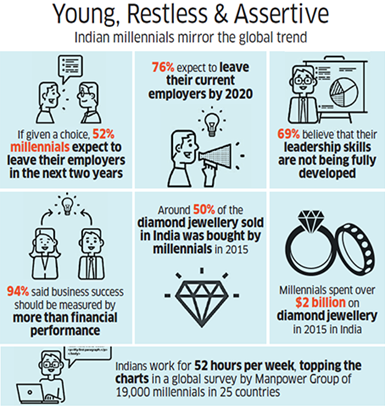 Financial planning and money management behaviours of India’s millennials varies significantly from the previous generation. 12th January 2018 is the 155th birth anniversary of one of India’s greatest thinkers and philosophers, Swami Vivekananda. It is also the 33rd National Youth Day; earmarked by the Indian government to inspire the youth of the country to follow Vivekananda’s ideals and philosophy. While these goals may seem lofty, there’s life to be lived by ‘Millennials’ or ‘Generation Y’ – terms describing those born between 1981 and 2000. While good education, being driven, and successful careers are high on their list of personal goals, so are following their passions, unconventional thinking, job-hopping, gender equality, travel, shopping, and partying. They are the “we want it, and we want it now” generation. It is, therefore, no surprise that savings and investments for the future figure further down on their list of priorities. Having said that, they do ‘save’ and ‘invest’ – it’s just different to what previous generations did. When it came to financial security, ‘Baby Boomers’ (born 1946–1964) and ‘Gen X’ (born 1965–1980) had job security and retirement benefits. Millennials have different aspirations to their predecessors, and that has inevitably affected the way they spend money and manage finances. Nearly two-thirds of India’s population will fall in the age group of 20 to 35 years by 2021. Malls, access to brands and products – previously not available in India, the internet revolution, and online shopping have transformed the world in which Gen Y lives. While goals such as buying a home, children’s education and retirement planning are important, millennials actively put off saving towards these ends. Instant gratification is the name of the game! 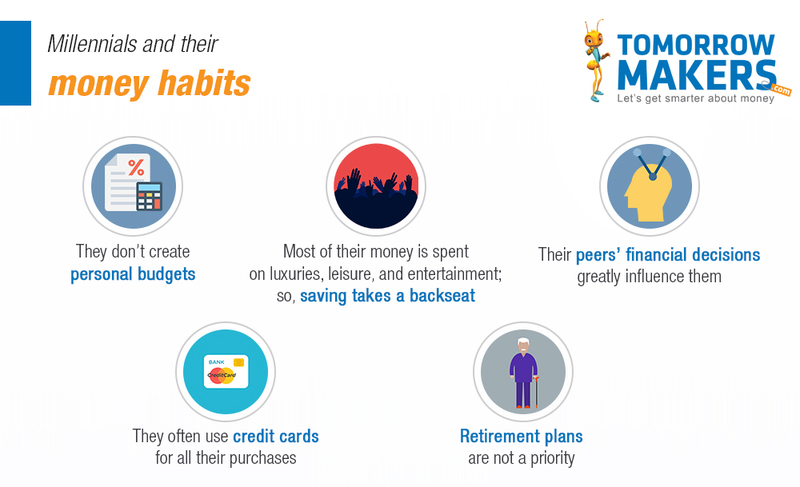 When it comes to savings habits, a 2015 study by ICICI Lombard found that Indian millennials spend 69% of their monthly income, and out of that, and they spend 50% on family and household items. Related: How money-savvy are the millennials? Related: How financially aware are you? A 2015 study, ‘Investor Behaviour: Young & Old’ by FundsIndia showed that, as expected, wealth increases with age. Those in the 20-29 age group seems to have the least wealth, probably because they would have only just started investing, which rises as careers progress and incomes increase, as do personal and familial responsibilities. Another way of looking at young investors is analysing what portion of their overall investment is in equity funds. This provides a great snapshot of whether Gen Y understands risk and the power of compounding. Contrary to some other findings, this study seems to suggest that Millennials seem to have a higher investment risk profile than believed, and are not averse to taking the swings of the stock market in their stride. It is quite possibly true, and a reflection of their unconventional approach to life and career choices. A trend that would be interesting to track in the future is whether Gen Y save – whether for a rainy day or for the future – at the same rate as previous generations, and how they re-balance their portfolios over time. A favourite pastime of the “now” generation is travel. Research conducted by ICICI revealed that 87% of affluent Indian millennials holiday overseas at least once every year, with nine out of 10 financing their own trips. That is in sharp contrast to Gen X, where only 12% travelled abroad for leisure. The survey also confirmed the fact that Gen Y has a greater affinity towards debt-related financial products. The ambition, hard work and job-hopping is focussed on living in the now, rather than planning for a distant future. Millennials seem to think nothing of making big-ticket purchases, but not the kind that their Baby Boomer parents made. Whatever one’s personal and lifestyle choices are, the adage of ‘save little, save early’ must always be at the forefront of young minds. By delaying saving and investment decisions to meet life goals, retirement, children’s education etc., even a small deferral increases the difficulty for this generation. Living in the past serves no purpose. Living in the present is great, but they must also remember that they will live tomorrow and for many more days to come.